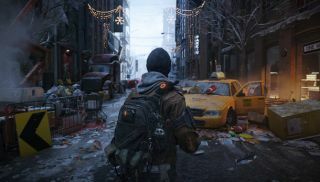 Tom Clancy's The Division, announced today at Ubisoft's E3 press conference, is an open world third-person shooter MMORPG set in the destroyed ruins of a plague-ridden New York City. Ubisoft Massive, developers of parts of Far Cry 3 and Assassin's Creed: Revelations , will be the studio in charge of development—check out the first trailer below. In this world building trailer, titled “ Breakdown ,” voiceovers describe the series of unfortunate events that lead to the shattered civilization shown in the gameplay video. During the gameplay video, staples of third-person shooter games like cover and an immersive heads-up display were shown—but we've never seen anything quite like this applied in an MMO setting. T oward the end of the trailer, the group of three players comes into contact with another group in what appears to be the first glimpse of PvP. Overall, the game looks like it has real potential to shakeup the MMORPG genre. Ready for the bad news? PC isn't mentioned as a release platform. At this stage of the game, though, that doesn't mean it won't come our way eventually. Check out The Division's website for more details. The game is scheduled to be released sometime in 2014.